Dan Johnson and Larry Rhoads of Ohio rocketed from 77th place on Day One into the winner's circle on Day Two at the Cabela's Masters Walleye Circuit's Spring Valley season opener on the Illinois River. "It's fantastic," Johnson, of Fayetteville, said of the dramatic come-from-behind victory over the 154-team field competing in the 26th annual Cabela's MWC Spring Valley tournament. After a decent start with 7.66 pounds, he and Rhoads brought in a 12.30-pound Day Two basket for a 19.96-pound total weight. The win earned them the $20,100 first-place cash purse plus a $1,000 Cabela's gift card from the Cabela's Angler Cash Program, $500 Lowrance Electronics HDS/Elite DSI award, $500 Berkley Baits Berkley Tackle Package, $1,750 in cash from the Big Fish Pot, along with the U2/Oxygenator award and pair of Okuma Dead Eye rod-and-reel combos for being the highest-placing Premier Team. Put it all together and it's more than $24,000 in cash and prizes. "It hasn't sunk in yet," added Rhoads, of Oregonia. He explained they fished a variety of tactics, but landed their largest fish, a 3.83-pound sauger that was big fish of Day Two, on a jig sweetened with a Firetiger-pattern Berkley Gulp! Minnow. David Kolb of Rockford, Michigan, and Jason Kopf of Avon Lake, Ohio, finished second with 19.67 pounds, worth $8,400 plus $1,000 from the Ranger Cup program. In all, the top 30 teams shared the $80,100 cash plus thousands more in sponsor bonuses and Big Fish Pot winnings. Rightly called the Sauger Capital of the World, the Illinois River yielded a total of 1,318 fish-mostly saugers with a few walleyes in the mix-weighing 2,142.7 pounds. Big fish of the tournament was a 6.30-pound walleye caught by Jeffery Evans and Benjamin Baune of Rochester, Minnesota. Illinois Department of Natural Resources fishery staff were on hand to utilize the fish for the state's stocking efforts before releasing the fish alive back into the Illinois River. To date, the Cabela's MWC tournament has helped the DNR produce more than 100 million saugers for stocking in the Illinois River. As it has for the past quarter century, the Spring Valley Walleye Club supplied an army of volunteers to host tournament operations, led by site coordinator Mike Hurless. "I have a great team of crew leaders and volunteers that help make this partnership with the MWC so successful," Hurless said. The Circuit donated $15 per boat to the Club for use in its fisheries projects and other conservation efforts. Since 1984, the Cabela's MWC has donated more than $300,000 to walleye conservation in states where its tournaments are held. Following Saturday's weigh-in, the Cabela's MWC, National Professional Anglers Association, Berkley and Zippo Outdoor presented a Youth and Family Fishing Clinic, giving away free rod and reel combos, a bike from Spring Valley City Bank, and Zippo Outdoor Family Camping Pack. 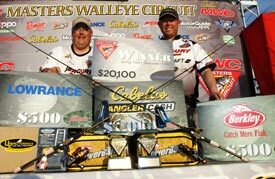 This was the first of nine Cabela's MWC qualifying tournaments in 2012. The remaining schedule includes the Detroit River at Trenton, Michigan, April 13-15; Lake Pueblo at Pueblo, Colorado, April 27-29; Lake Erie at Huron, Ohio, May 18-20; Mille Lacs Lake at Isle, Minnesota, May 31-June 1; Lake Winnebago at Oshkosh, Wisconsin, June 29- July 1; Lake Oahe at Pierre, South Dakota, July 28-29; the St. Mary's River at Sault Ste. Marie, Michigan, August 24-26; and Cass Lake, Minnesota, out of Stony Point Resort, Sept. 14-16.